You will love this homemade peanut butter cake recipe. It produces a wonderful moist peanut-buttery masterpiece that you will make often. Butter two 9 inch cake pans and dust the inside with flour and tap out excess. Line the bottom of the pans with wax or parchment paper. Put the cake pans on a baking sheet lined with parchment paper or a silicone mat. Mix sugar and self-rising flour; set aside. Bring to a rapid boil 2 sticks of butter, 1 cup of peanut butter, and 1 cup of water. Pour over dry ingredients. Add to that 1/2 cup buttermilk, eggs, 1 teaspoon vanilla and then mix with mixer. For every cup of all purpose flour, you have to add 1-1/2 teaspoons of baking powder and 1/2 teaspoon of salt. These measurements are perfect and any variations may affect the texture of the end product. Thoroughly mix the ingredients and your self rising flour substitute is ready. You may also sieve the flour, two to three times, so that the baking powder and salt gets mixed up uniformly. This gives an uniform texture to the baked product. Let sit for 15 minutes and it's ready for the recipe. This frosting is amazing--it balances flavor against sweetness well, and the texture is perfect: creamy, fluffy, not oily at all. Do not use margarine; use butter. Butter will give you beautiful, fluffy icing (and that's what you want). I always use this recipe with my peanut butter cake recipe. Beat the peanut butter and butter for at least 3 minutes. Add the powdered sugar a little at a time and mix well after each addition. Pour in the heavy cream and beat for 3 to 4 more minutes. Frost the cake. 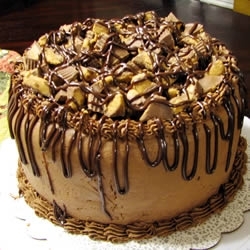 For my peanut butter cake recipe (see photo above) I frost it, and drizzled chocolate sauce over the top. Then I cut up Reese's peanut butter cups and sprinkled over the top of the cake. Out of this world good.